If you are an avid cardriven.ca reader (in which case, thanks for the support! ), you may remember that I recently reviewed the redesigned Mazda6 back in August of this year. 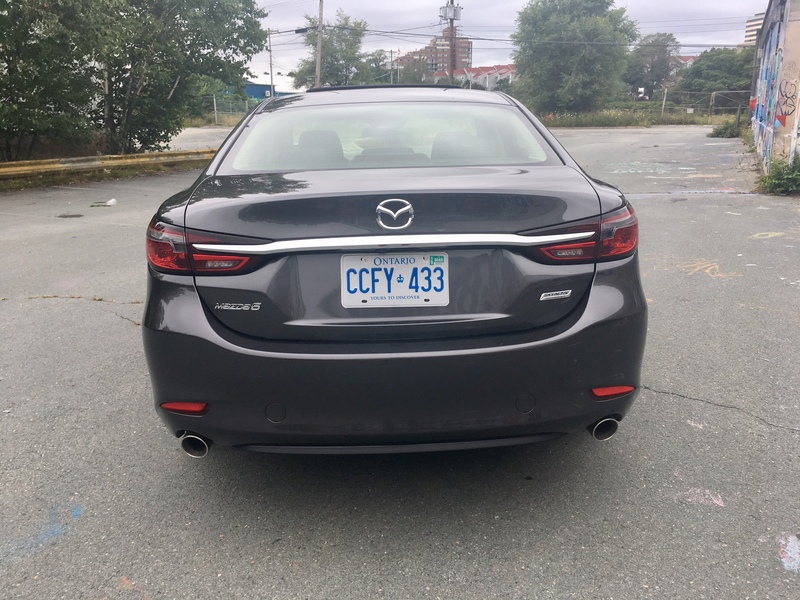 That vehicle in particular was a top tier Signature trim model which featured all the bells and whistles you could possibly get in a Mazda6, including the 2.5 litre turbocharged engine. 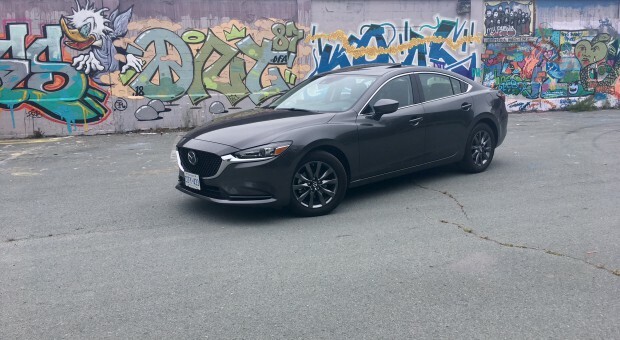 This time round I’ll be taking a closer look at the Mazda6 most in the segment are likely to buy: the mid-trim GS-L.
And when it comes to what you get in the mid-trim, most buyers might be pleasantly surprised. Take the exterior for instance. Even in the mid-trim you still get LED headlights and tail lights (with proper LED amber turn signals), rather decent looking 17-inch alloy wheels, a mesh grille and tasteful bits of chrome trim here and there to help it pop. My tester particularly stood out as the paint colour matched the colour of the alloys. 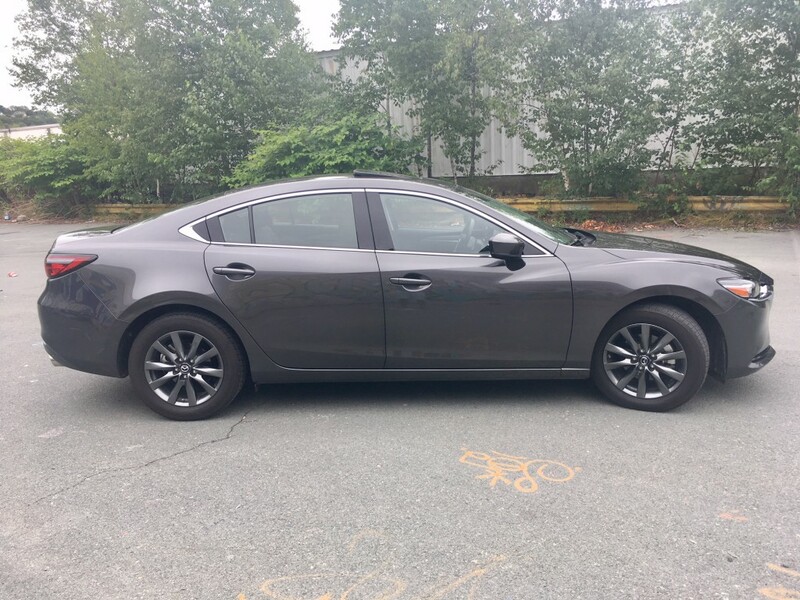 One person even mentioned to me that it looked like a cop car (not entirely sure I agree with that one), but one thing is for sure, even in the mid-trim, the Mazda6 GS-L still stands out from the crowd. Inside continues to impress. 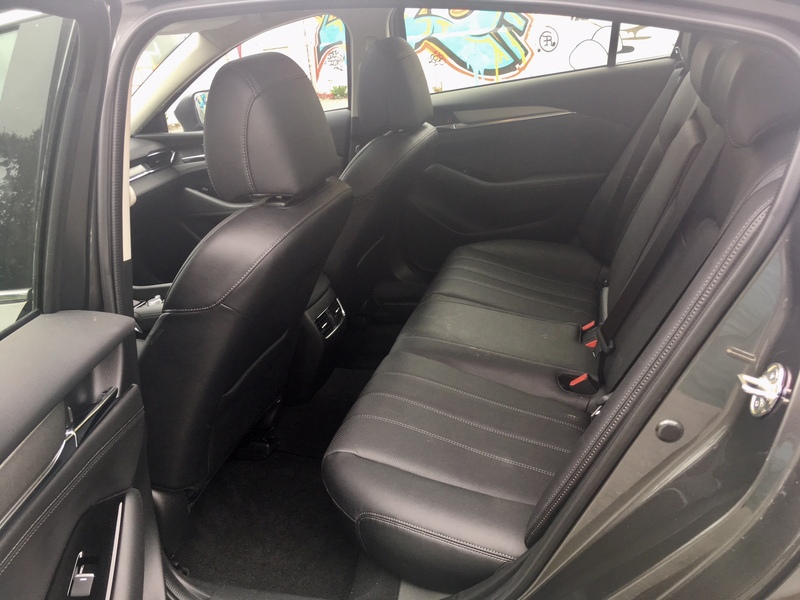 Sure, there’s no real wood trim and suede surfaces like in the Signature trim, but the design still looks contemporary, clean and even premium-like. A lot of people think about Hyundai when it comes to value, and rightfully so, however I think Mazda may have a case to be made here too. 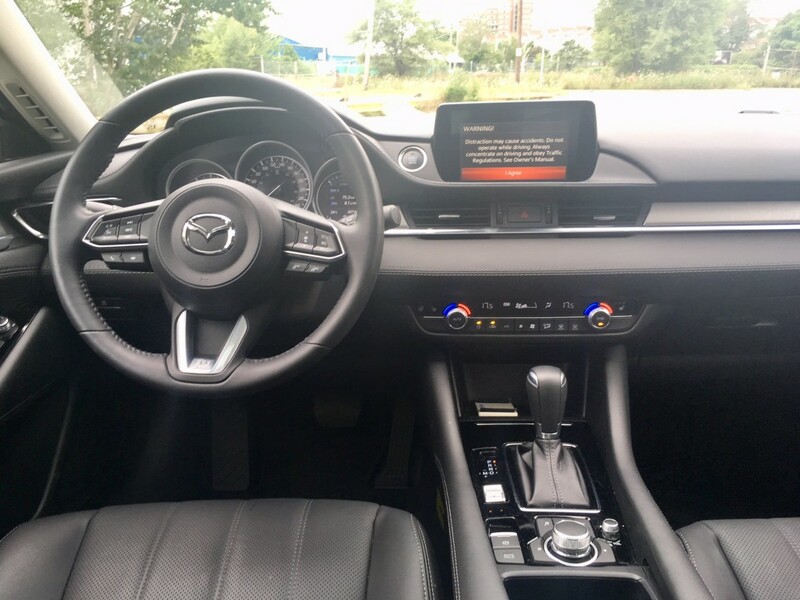 For example, the list of features standard in the interior include an 8-inch touch screen, Bluetooth, dual-zone climate controls, a heated steering wheel, adaptive cruise control, blind sport monitoring, rear cross-traffic alert, lane keep assist, leather seats (with the driver’s side being 10-way power adjustable) and a moonroof. That list in and of itself sounds like it’s the fully loaded model we’re talking about, doesn’t it? Quite frankly, the only thing that gives away the fact that you’re not driving the fully loaded trim is the 17-inch wheels. Of course, if you were to lift the hood to show people the engine bay, there would be another thing that would give away that this is the mid-trim – or more specifically, a lack of a feature would give it away: there’s no turbo. That’s right, this is the same SkyActiv engine that the top trim gets, except it’s stripped of it’s turbo, which means it makes less power. Still, the 187 horsepower and 186 pound feet of torque matched to a six-speed automatic isn’t anything to sneeze at. At no point during my week and a half with the GS-L did I think “man, this thing could use more power”. And I’m a guy that certainly loves power. Sure, it doesn’t pull off the line with as much gusto as the turbocharged Signature trim does, but it’s smooth in its operation with the transmission and engine working together nicely. For the record, 0-100 times have the GS-L pegged at around 8.3 seconds. Also for the record, if you want the turbocharged engine in the GS-L, you can have it for an extra $2,000. When I tried the turbocharged version, I mentioned a wish for the shifts to be a tad quicker, but I didn’t seem to experience this as much this time around; perhaps the turboless engine feels a bit more comfortable with the transmission. One thing that does remain is the odd noise the engine emits both at idle and during the drive. It does have a bit of a clattery sound to it, almost like a diesel, but not quite. It sort of sounds as if it’s running on an odd number of cylinders, such as a five cylinder. That odd noise penetrates the cabin quite easily when it is pushed, but remains quiet and largely out of the way when driving. My fiancee and I decided to take a bit of an unexpected trip to PEI, which is about a four hour drive from Halifax, Nova Scotia. We were going to do the whole trip in a day, which meant eight-hours of driving, where I was the sole driver. Never was I so happy that the mid-trim came with so many nice creature comforts standard to make the long drive more comfortable and tolerable. Highway driving is as good as the turbo, though the obvious advantage to the turbo is more passing power when you need it. The GS-L didn’t feel sluggish when passing, but it also didn’t feel particularly willing either. The engine and the transmission are clearly programmed with fuel efficiency in mind so taking up sudden bursts of power isn’t something the GS-L jumps at. Still, during the four hour drive, the GS-L felt comfortable, relatively quiet and unassuming. 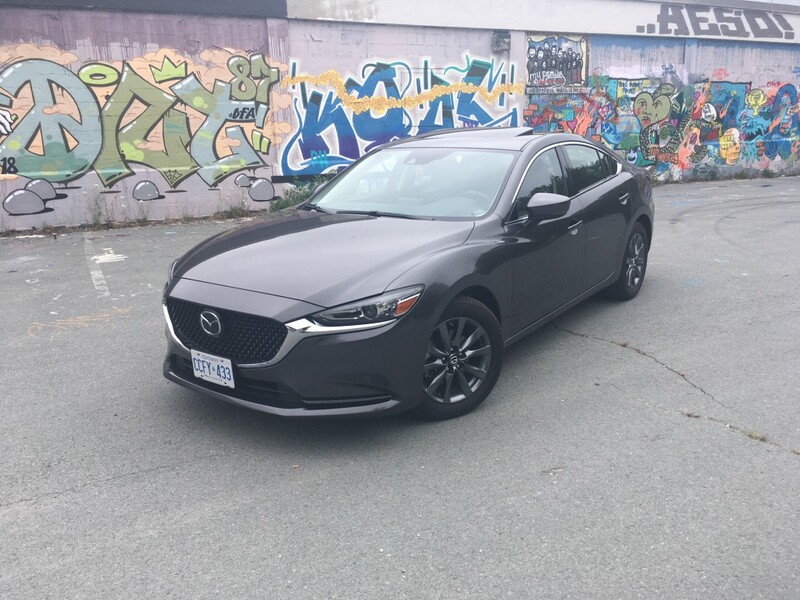 Thanks to some good dialled in steering and the overall feeling of assured solidness, our drive felt typically Mazda, that is to say, it felt engaged. Once we got to PEI, we took a few twisty back roads so I could really test the zoom zoom factor, and again, while this isn’t a particularly quick vehicle, it certainly is among the best through the bends in this segment. Body roll is minimal and it isn’t until you get up to higher speeds where some slight understeer can be felt. Perhaps one of the biggest reasons to take the normally aspirated engine over the turbocharged engine is the fuel efficiency advantage. Officially, the non-turbo is rated at 9.1 L/100 kms in the city and 6.7 highway. Compare that to the turbo’s numbers which are 10.0 in the city and 7.5 highway. In fact, when I drove the turbocharged 6 back in August, which included about 4 hours worth of straight highway driving, I returned an average of 9.2. The GS-L did much better at an average of 6.7, but keep in mind, that included eight hours of straight highway driving. Those high hours of straight driving were great because of the standard features, and I mentioned value, but it is still certainly going to cost you. At $33,000 for the mid trim, where competitors keep their mid trims models a few thousand less. At that point you’re going to have to see where exactly is your bang for your buck. 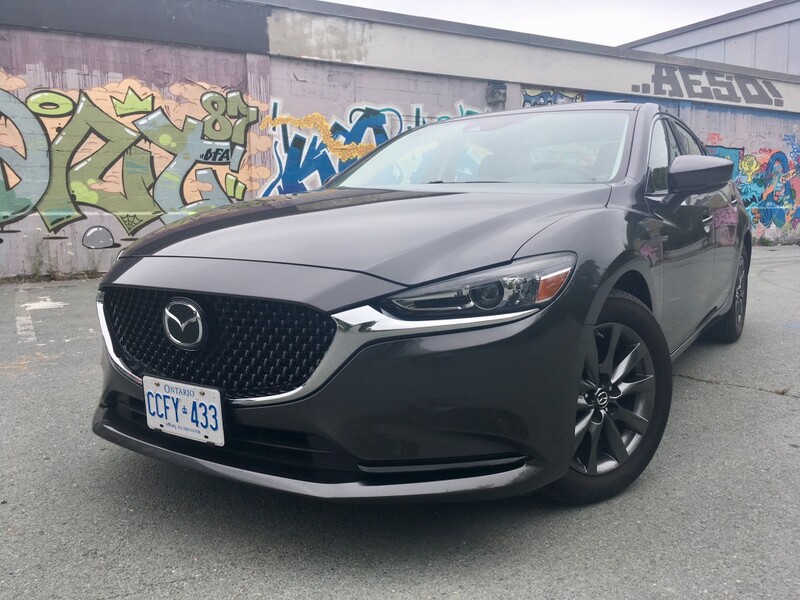 But as far as the Mazda6 GS-L goes, regardless of price point, it remains an impressive mid-size family sedan to be sure, even when turboless.